Congratulations to Vanesa Garkova who submitted the winning design for our DesignCrowd book cover contest. “I’m currently busy writing RESIST book 2 of the Among Us Trilogy. My book marketing team and I held a DesignCrowd contest from the official Among Us Trilogy blog site. Vanesa Gorkova was the winning graphic designer coming in first place against 18 other submissions. My developmental editor says it is too soon to share this to you but I can’t help it. I am so excited about the new book cover. RESIST takes our characters Harry Doubt and Cristal into the supernatural realms of our world. They expose the secrets of who or what is living among them uncovering the truth behind catastrophes that lead to the apocalypse. I can’t say too much or I’ll be given a #spoiler alert from my book launch team. 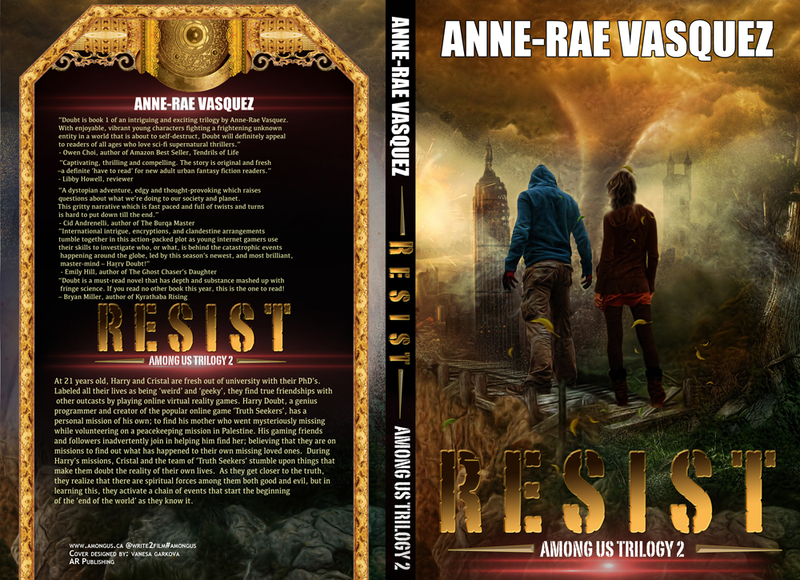 Professional graphic designers have submitted their work to win the book cover design contest for “Resist” book 2 of the Among Us Trilogy. 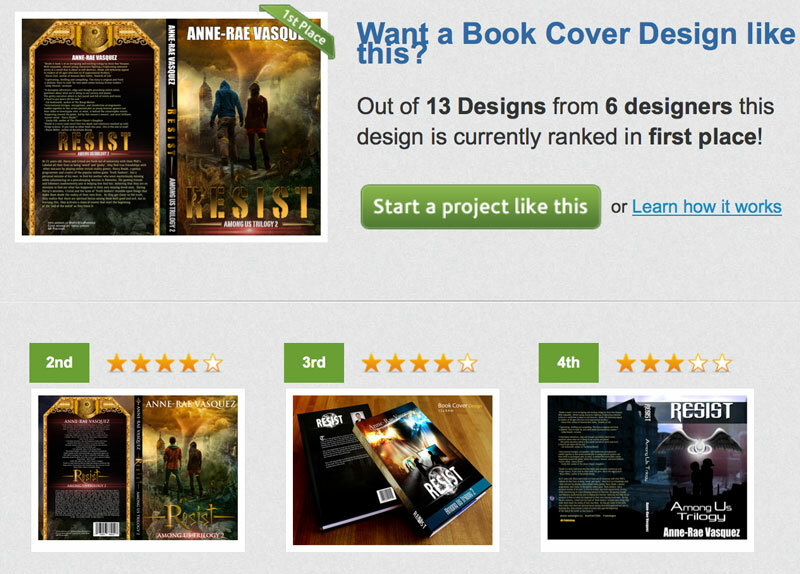 Please cast your vote to help us choose the best book cover design. Deadline is Friday January 17. Click here to vote now! See sneak peek screenshot below. Anne-Rae Vasquez is a freelance journalist for Digital Journal.com, author, film maker and web design programmer. 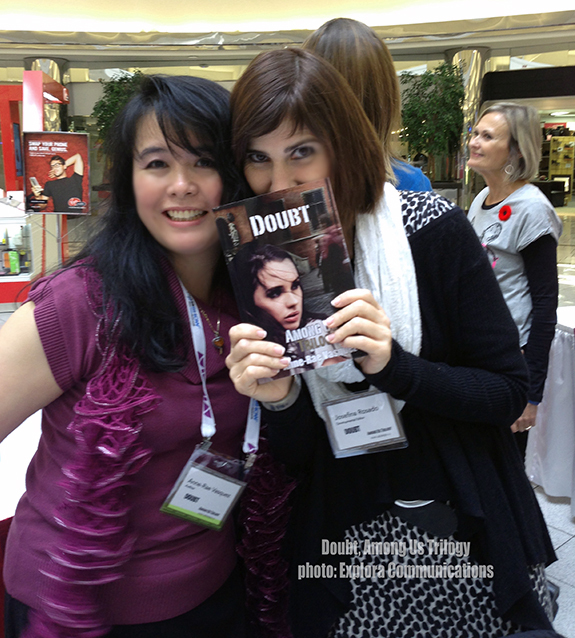 Her latest novel, Doubt, is the the first book in the Among Us Trilogy series. Her other works include: the novel and screenplay for the award winning feature film and web series Almost a Turkish Soap Opera, Salha’s Secrets to Middle Eastern Cooking Cookbook Volume 1, Gathering Dust – a collection of poems, and Teach Yourself Great Web Design in a Week, published by Sams.net (a division of Macmillan Publishing). Almost a Turkish Soap Opera was her feature screenplay and film directorial debut. Anne-Rae Vasquez is available for interview. My developmental editor, book launch team and I had the pleasure of launching my latest book, Doubt, book 1 of the Among Us Trilogy at the Rain Dance Book Festival. Take a sneak peek at some chapters… don’t worry, you’re not obliged to buy… just share and tell your friends – hey, we had to try, right? a Rafflecopter giveaway*Winner(s) are chosen at random via Rafflecopter.com *Winner(s) will be contacted if they win and have 3 days (72 hours) after email is sent to claim their prize. If the prize is not claimed within the time frame of 72 hours, a new winner will be chosen. * The new winner will have 3 days (72 hours) from the time of notification to claim their prize.Personal information is never shared. 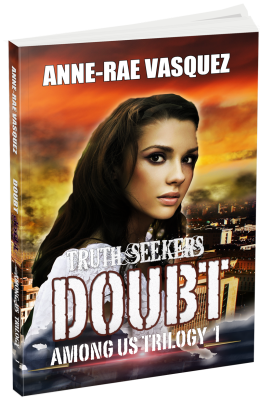 * Doubt book launch team reserves the right to end a giveaway early without notice or prolong if it is deemed necessary. * Doubt book launch team reserves the right to disqualify an entry. * Doubt book launch team is not responsible for lost or damaged items. 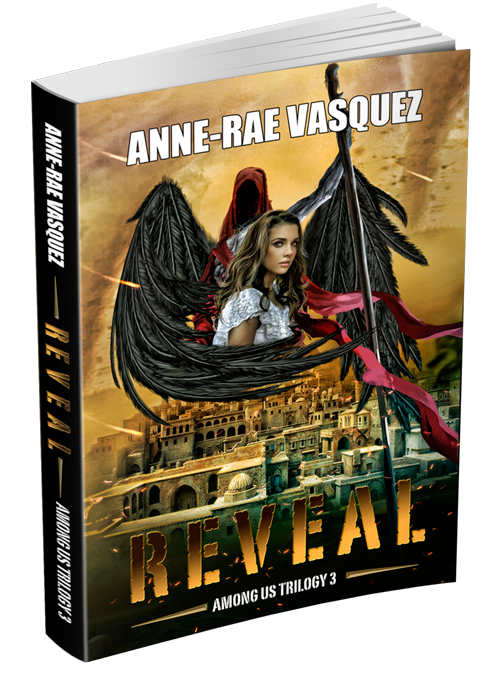 Among Us Trilogy, anne-rae vasquez, book cover design contest, Doubt, Doubt book blog tour, vote, YA paranormal. Bookmark.